Nonprofits often rely heavily on their donors and volunteers. Once you’ve built a steady foundation of loyal supporters, though, it’s important to regularly add to that in order to keep moving forward. But bringing in new donors can be challenging, especially if you don’t have a marketing background. 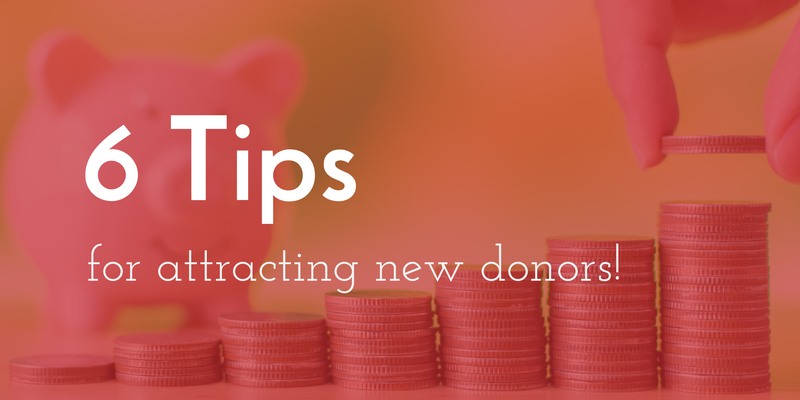 Fortunately, there are a few simple things you can do to bring in new donors while also maintaining the base you’ve created. When you think about spreading the word related to the work you’re doing, you may immediately go to marketing and advertising. But brand awareness can be simply a matter of setting up active social media profiles and maybe paying for a few social media ads. Networking is also an important part of growing a nonprofit. You can do this by simply participating in local events, perhaps even setting up a booth at a community festival or sponsoring a local sports team. Your best advocates are your current supporters. Incentivize them to amplify their message about the work your organization is doing by offering a prize to the volunteer who brings in the most new donors. Encourage donors to share their support on social media using a specific hashtag, then have a party to thank those who participated. If you want to reach new donors, an event can be the perfect way. But first, it’s important to understand your audience’s interests. While a high-priced dinner may be the perfect fit for an organization that caters to wealthy donors, it isn’t ideal for many nonprofits. Instead of a fancy gala, a fall carnival may produce better turnout and convert more participants into long-term supporters. Donors are more than financial contributors. The most passionate donors take an active role in your organization. At the very least, let everyone who supports your organization see how those contributions are making an impact, whether it’s simply through posts on social media or a monthly newsletter. Showing appreciation to your donors goes beyond an end-of-season event. Although that’s important, you should also send notes of appreciation throughout the year. A great time is when they send a contribution, but you can also send follow-up thank you’s at the end of the fundraiser and on the anniversary of the donation. Building your nonprofit’s support base can come with a few challenges, but if you take a few proactive measures, you can grow your organization. As more donors come your way, make sure you have processes in place to help them get the word out so that you’re adding more donors with each campaign. We hope this makes you a little more comfortable about attracting new donors. If you need any help along the way, please contact our marketing team.